A panel discussion featuring writers from Problem Areas with Wyatt Cenac, Late Night with Seth Meyers, Full Frontal with Samantha Bee, and other NY-based shows, together to talk about how they use humor and satire in their day jobs and the process of applying to and writing for TV. Stick around after for a chance to network with other writers, agents, and managers and to pitch your work! Buy your ticket here. 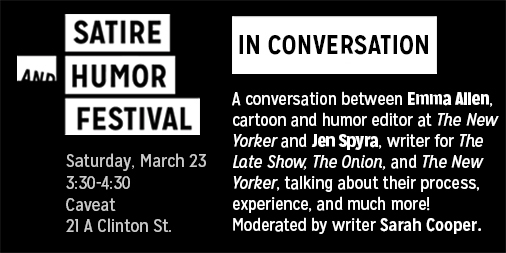 Come to Magnet Theater (254 W 29th St.) on Sunday, 3/24 at 1pm for a 75 minute panel on the wonderful world of humor and satire books. You'll hear from writers, agents, booksellers, and marketers as we discuss the process from the initial idea (or viral piece!) to the writing process to getting the book into the hands of readers. This panel is geared toward straightforward tips and professional advice. Moderated by Caitlin Kunkel, co-founder of the festival and co-author of 2018 humor gift book New Erotica for Feminists: Satirical Fantasies of Love, Lust, and Equal Pay. Literary humorists reading their most literary humor! An Evening of Humorous Readings is a long-running, popular show of literary humorists reading their most literary humor! The show is a showcase of short humor, like the kind you find on McSweeney’s or Shouts and Murmurs, read aloud by the people who wrote them. An Evening of Humorous Readings has featured writers from Saturday Night Live, Late Night with Seth Meyers, The Onion, The New Yorker, and more! Buy your ticket or festival pass here. In Conversation: A conversation between the most interesting and accomplished writers, editors, and creators in the comedy writing world. Our guests will share their processes, experiences, and tips. A great chance to hear from and ask questions of the best! Lineups announced soon. 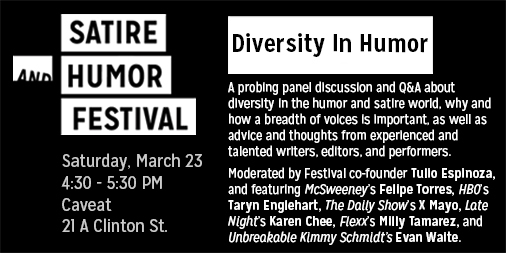 Diversity In Humor Panel: A probing discussion and Q&A about diversity in the humor and satire world, why and how a diversity of voices benefits, as well as advice and thoughts from experienced and talented writers, editors, and more. Tickets through the Caveat site here! Kick-Off Event at Treadwell Park in Hell's Kitchen! Hey hello you made it! Join us for a soft landing at TREADWELL PARK at 7pm on Friday for some light, not-at-all-scary networking, casual chatting, and lot of lulz to kick off the weekend. Hosts (a variety of writers and site editors) will be circulating to make sure you are talking and feeling welcome. We will be providing light snacks and there will be some free drinks avail as well. There will also be a raffle for free tickets to see THE LAW FIRM at UCB next door at 10:30pm. FREE AND OPEN TO ALL! Treadwell Park is located at 510 W. 42nd St.